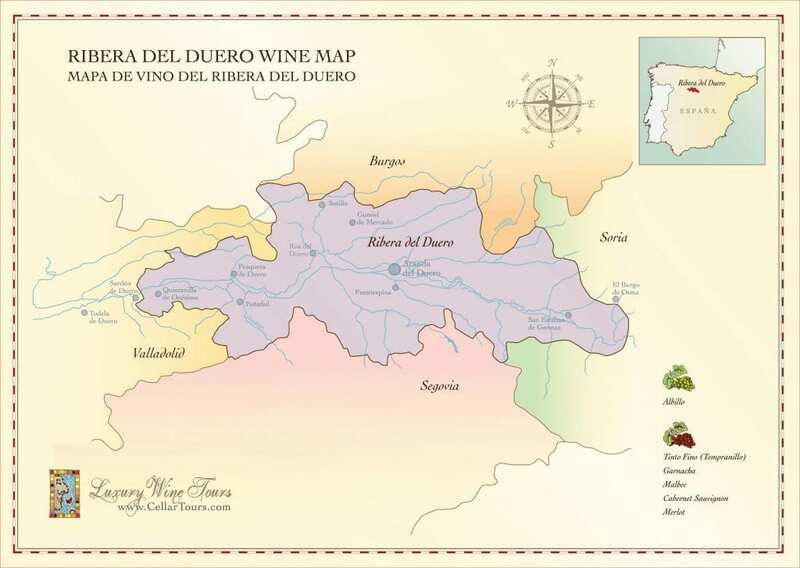 Located in Castilla y Leon, halfway between Bilbao and Madrid, Ribera del Duero is a vast and arid fine wine region punctuated with Crusader castles and mile after mile of vineyards. The primary grape here is Tinto Fino (AKA Tempranillo) and it is used to make a range of mid-level all the way up to ultra-premium wines. Vega Sicilia and Pingus are wine royalty at the super top end, while fabulous premium level bodegas include Pesquera, Mauro, Emilio Moro, Aalto, Hacienda Monasterio, Pago de los Capellanes, and Lopez de Cristobal to name but a few of the excellent wine estates in Ribera. Towns of interest in the region include historic Peñafiel, medieval Peñaranda de Duero and Aranda de Duero with its gorgeous underground wine tunnels. Foodies are well served at Michelin starred Le Domaine at the Abadia Retuerta wine estate, which also houses a stunning hotel in a converted monastery. Discover this region on a Luxury Ribera del Duero Wine Tour. Embed Ribera del Duero Wine Region Map on your site: copy and paste the code below.